Theo Walcott is an airplane. Emmanuel Frimpong serves his one match ban for being sent off via two yellow cards last week. Alex Song and Gervinho will each serve the second match of their respective three match bans. This leaves the midfield mighty thin, even before you mention the fact that Jack Wilshere could miss three more weeks with his ankle injury. Kieran Gibbs will not be back. This time writing the preview, I remembered that we had Sebastien Squillaci as a player, and he's still hurt. Abou Diaby is out until next month. Benik Afobe was being considered for inclusion in the squad this week, but he has a slight knock as well. And, the worst news, Tom Vermaelen took a kick to the ankle on Wednesday, and faces a late fitness test. Szczesny! He'll start! Van Persie! He can start! Walcott, he'll start! Aaron Ramsey will start! So... that's four. Predicted XI: Szczesny, Jenkinson, Koscielny, Vermaelen, Sagna, Djourou, Ramsey, Rosicky, Arshavin, Walcott, van Persie. Darren Fletcher is stepping up his return from a virus, having played 90 minutes for the reserve side this week, so he may feature in midfield. Rio Ferdinand is hopeful to play after suffering a hamstring injury. United would prefer to have one of their top choice center backs available, as Nemanja Vidic (who tends to just haunt Arsenal) is ruled out with a calf problem, while Rafael Da Silva is out for a while with a shoulder injury. Edwin van der Sar fumbles in West Brom's equalizer. Over their last six league matches, Arsenal have won just once and Manchester United have lost just once. Of course, that was the same game, as Arsenal beat United 1-0 at the Emirates in early May. In their last 13 league matches (i.e. everything since the Carling Cup final), Arsenal have picked up just 13 points. That's the worst run of form in Arsene Wenger's career with Arsenal. Spread out over an entire season, and that would be 38 points, which is relegation form in many seasons. If you take into account every other side's results over the same time period, Arsenal would be 15th in the table. There's really not much more I can say about Arsenal's league form at this point, you all know how it's been. Arsenal failed to score in either of their first two league matches for the first time since 1969/70 (you might recall they won the Double a year later). Arsenal have not gone goalless in their first three matches since 1953/54, a year in which they picked up two points from their first eight and eventually finished in 12th. They were defending champions that season. Last season, Manchester United won 18 of 19 league matches at Old Trafford, dropping points only once at home in league play (a draw with West Brom on October 16). United have won 16 straight league matches at home and have not lost at home in 22. Arsenal's most recent match against Manchester United was the 1-0 win at the Emirates on May 1st, in which Aaron Ramsey broke the deadlock with a 56th minute goal. Cesc Fabregas didn't play in that match. Samir Nasri was removed hurt at halftime when the match was still 0-0. So really, Alex Song, Gael Clichy, and Jack Wilshere were the players involved in that win that are not available again in this one. The midfield difference is still worrying. Arsenal lost on both trips to Old Trafford last year, falling 1-0 in the league in December and 2-0 in the FA Cup in March. Arsenal's last goal at Old Trafford was scored by Andrei Arshavin in 2009, giving Arsenal a 1-0 lead at halftime that they would squander and lose 2-1. Thank you, Abou Diaby own goal. United are unbeaten in their last seven home matches against Arsenal, winning six of them (and clinching the league title with the one draw). Before Arsenal's win in May, United had won four straight against the Gunners. Arsenal's last win at Old Trafford came on September 17, 2006. Arsenal went into that match in a similar predicament to the situation they are in now. They sat 17th in the table, picking up two draws from their first three matches. The United win kicked off a five match winning streak. Arsenal eventually finished that year in 4th, goal difference behind Liverpool for 3rd. He looks absolutely diabolical here. 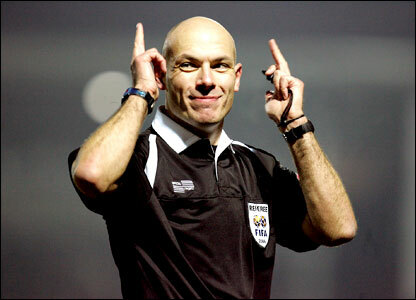 The referee, surprise surprise, is South Yorkshire-based Howard Webb. Arsenal managed to avoid Howard Webb for much of last season; he took charge of matches involving the Gunners just twice, though one was this fixture, which Manchester United won 1-0. Webb showed four yellow cards in that match. They were all to Arsenal players. He also gave United an exceedingly dubious penalty, which Wayne Rooney then kicked out of the stadium. The other match he worked for Arsenal was a 2-1 win at Everton in November. As such, this is the first time Arsenal has had to see Webb in eight and a half months. Webb took charge of four Manchester United matches last year. All were at Old Trafford and all were United wins. In addition to the aforementioned Arsenal match, he worked United's 3-2 win over Liverpool in September, their FA Cup triumph over Liverpool in January (1-0 on a second minute penalty plus Steven Gerrard was sent off), and their 2-1 win over Chelsea in May that effectively sealed the league, a match where Chelsea really never showed up anyway. In half of the last 10 matches Webb has worked at Old Trafford, he has awarded United a penalty. Arsenal's clash with Manchester United is the final match of a weekend which will see six matches played on Saturday and four played on Sunday. There are two early matches on Saturday, as the weekend kicks off with a West Midlands derby as Aston Villa hosts Wolves, then Wigan hosts QPR in a match moved earlier because Wigan's rugby team, Wigan Warriors, are set to play Leeds Rhinos in the Challenge Cup final at Wembley the same day. Three matches kick-off in the normal time slot of 10 a.m. Eastern (3:00 p.m. in England) as Blackburn hosts Everton, Chelsea hosts Norwich, and Swansea hosts Sunderland. Bolton travels to Anfield to face Liverpool in the late match. On Sunday, Newcastle opens the day playing host to Fulham, Tottenham Hotspur has their home opener against Manchester City, and West Bromwich Albion later hosts Stoke City.